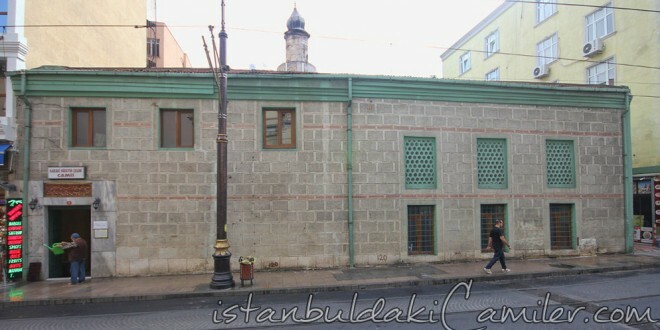 It is located in the Ouarter of Hoca Pasa, Sirkeci on Hudavendigar Road. The real name of Karaki Huseyin Celebi Mosque, which is also known as Salkim Sogut (Weeping Willow) Mosque, is Kara Kadi. It is a roofed structure with walls made of face stones. It was completely rebuilt in the middle of last century; the face stones, jambs, and iron fences of the old building were used in the renovation. Its ceiling is wooden with lathes and the second floor windows are plain.It is a square building with dimensions 10,3 m * 10,3 m. It has a last congregation section of about 350 square metres. As understood from its inscription dated 1288 of the Hegira (1871), Attorney General Mumtaz Ebubekir Efendi sponsored its second construction. Its minaret with a single balcony vvhich used to situate on today’s tramline was rebuilt to the mosgue’s left side in about 1938.